More than 30 years ago, a bicycling magazine named Phoenix one of the least bike-friendly communities in the country. Ouch. But since then, Phoenix put its shoulders to the wheel to reinvent the metro area as a place that bicyclists love—by adding bike lanes, scenic routes, desert trails and easy-to-navigate paths; building bridges and tunnels to carry cyclists over or under busy roads; and installing bike racks on streets, city buses and Valley Metro Light Rail cars. Today, the Phoenix area offers more than 700 miles of bike infrastructure, with close to 600 miles of bike lanes and routes and more than 100 miles of off-street trails and paths. It&apos;s now one of the top communities for bicycling in the country. In 2014, Phoenix earned bronze status as a bicycle-friendly community from the League of American Bicyclists. "So many people bike now," says Joseph Perez, the city&apos;s bicycle coordinator. "The culture has changed. What&apos;s not to love? The city&apos;s mostly flat, and the sun shines almost every day." Get in on the two-wheeled fun with bike sharing, rentals, loans and tours. Determine your skill level, pick your bike and pedal off. Here are just a few options. Cruisers are made more for fun than fitness. So they’re perfect for exploring downtown Phoenix’s bike-friendly historic neighborhoods, such as the Willo or Encanto-Palmcroft districts, where you’ll find lovingly restored homes—in architectural styles ranging from Mission Revival to Classic Bungalow—dating to the 1920s. Or wind your way along the banks of the Salt River Project’s web of irrigation canals, where more than 100 miles of paved and packed-dirt paths crisscross Greater Phoenix, passing neighborhoods, urban parks and shopping and entertainment districts. For those who like a reward at the end of a morning ride, try the beer brunch at O.H.S.O Eatery + Nanobrewery’s Arcadia locale, where bike racks, locks and tools for simple repairs attract riders from the nearby canal path. Or there’s downtown’s Phoenix Public Market Café, where breakfast is served until 3 p.m., and it’s never too early for a bourbon milk punch. You can also fill your bike’s basket with fresh goodies from the adjacent open-air farmers market, held Saturday mornings and Thursday evenings. Before you rent a cruiser, check with your hotel to see if it has a bike program. Greater Phoenix properties such as The Clarendon Hotel and Spa, Kimpton&apos;s Hotel Palomar Phoenix, JW Marriott Desert Ridge Resort and Spa, Bespoke Inn and The Saguaro all offer guests complimentary loans of bicycles. Pack the trail mix, because Greater Phoenix is heaven for mountain biking. Between its parks and preserves, the metro area boasts hundreds of miles of mountain-bike-friendly trails that put you in the midst of the Sonoran Desert, often just minutes from urban centers. As you careen around switchbacks, keep your eyes peeled for saguaro and prickly pear cactuses, spring wildflowers and desert critters such as roadrunners, coyotes and javelinas. In northeast Phoenix, parts of Phoenix Mountains Preserve offer lengthy, easy treks, such as the 10.7-mile Charles M. Christiansen Memorial Trail, which uses a series of tunnels to cross under a freeway and busy streets. Or try more challenging rides, such as the 4.8-mile Perl Charles Memorial Trail, which loops the backside of landmark Piestewa Peak. At South Mountain Park, the National Trail follows 14.5 miles of the mountain’s ridgeline, offering great views of downtown Phoenix. For those who want to hone their skills, the Maricopa County Parks and Recreation Department has specially constructed competitive tracks (as well as general mountain biking trails) at Estrella Mountain, McDowell Mountain and White Tank Mountain regional parks. Don’t own a mountain bike? No problem. The outfitters mentioned below offer rentals, guided tours and transportation to and from area hotels. To explore the heart of the city sans car, check out Grid Bike Share. This program places 500 easy-to-ride, lime-green bikes at 50 “hubs” throughout central Phoenix. The project was launched in 2014 as a public-private partnership with the City of Phoenix to encourage cycling. You can rent the three-speed bikes for a nominal fee via mobile app, online or at a central kiosk. You can reserve them in advance, but you can also pick up one on a whim at any of the hubs. The bikes come equipped with a lock, a basket and solar-powered front and rear lights. A GPS system keeps track of the bike’s locale. Want to travel farther afield? The program is set to expand to the neighboring cities of Tempe and Mesa this year. With Grid Bike Share hubs near downtown hotels, light-rail stations and the Phoenix Convention Center, it’s easy to wander Phoenix’s bike-friendly downtown neighborhoods, such as artsy Roosevelt Row or über-boho Grand Avenue. The bikes also make for perfect transportation to refreshment destinations, such as The Duce, where you can grab a cocktail and play ping-pong, or the Phoenix Ale Brewery, where you can wheel your bike inside the taproom to sample watermelon ale or a hefeweizen. For adventurous riders who don’t mind biking 10 or 20 (or more!) miles at a time, bike lanes and bikeable routes lead outward from downtown Phoenix to different parts of town—and even into different cities. From downtown, ride east to Papago Park to admire sandstone buttes and visit the Desert Botanical Garden and the Phoenix Zoo. To the north of Greater Phoenix, the Sonoran Preserve’s Skip Rimsza Paseo is a five-mile, paved multi-use path that winds past the gentle hills of the city’s newest desert preserve. To the south, South Mountain Park—with its more than 16,000 acres of desert and mountainous terrain—is ideal for cycling. During the park’s monthly Silent Sundays, the rule on the paved roads is bikes only, no cars allowed. Pedal to numerous viewpoints with breathtaking city vistas. Naturally, you’ll want to stop for sustenance along the way. Gertrude’s serves up seasonal dishes at its indoor/outdoor setting in the midst of Papago Park’s Desert Botanical Garden, while The Farm at South Mountain offers breakfast and lunch options in the shade of an old pecan grove. On the way back from the Sonoran Preserve, coast into Culinary Dropout at The Yard, a former motorcycle garage, for cocktails and appetizers. Written by Nora Burba Trulsson. 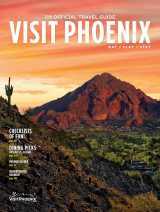 Originally printed in the 2016 Phoenix Official Travel Guide, published by Madden Media.